With strong, continued growth, the Virginia Varsity companies have aggressively expanded to keep up with customer demand. 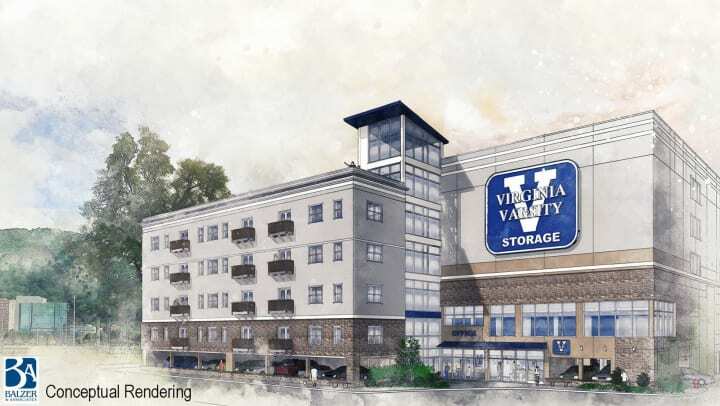 Both Virginia Varsity Self Storage, with five locations across the region, and its sister moving company, Virginia Varsity Transfer, have expanded at multiple locations in recent months – and new projects are on the horizon. Through internal customer data, the Franklin Road/Downtown area has become the top company priority for a new storage project to serve Virginia Varsity’s customers and area businesses. Virginia Varsity has a contract to purchase the Graves-Humphreys Building on Franklin Road and plans a major storage and mixed-use project. The property is currently owned by Triple S Realty and home to a number of businesses in its 93,000 square foot building and 2.2-acre site. A dramatic, long-term vision of the property includes updates to the current building and a new, modern, multi-story storage building. Existing office tenants will mostly be unaffected, and the building and facilities will receive upgrades. Virginia Varsity will have management and other offices on-site and is exploring an exciting residential component in this multi-phased project.